A Malaysian food, travel and lifestyle blog. 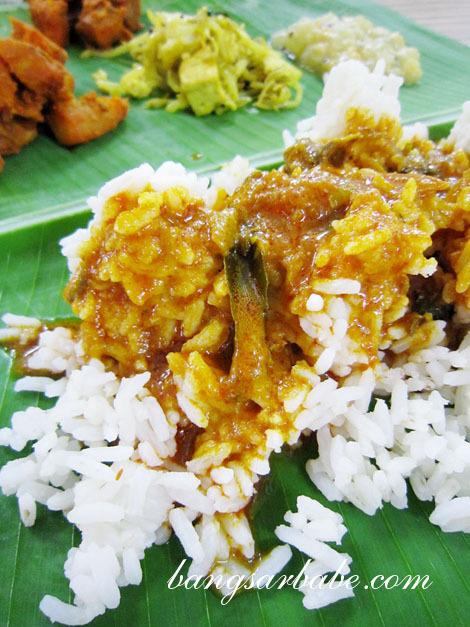 Banana leaf rice. It is a typical dish in South Indian Cuisine comprising white rice with an assortment of vegetables, papadum and curries on a banana leaf. The leaf isn’t there just for aroma or presentation; the steam of the rice is said to release the coating on the banana leaf, which aids in digestion. While it is meant to be a vegetarian dish, you can opt to have it with a side of meat or fish. I also learnt that to show your appreciation after the meal, fold the banana leaf towards you to signify that the food was good. If you fold it away from you, it implies that you didn’t find the meal satisfying. I nodded my head when the man at Vishal Food & Catering asked, as I stood in front of the shophouse looking slightly unsure. It was almost 3.30pm and I didn’t know if the place was still open. I found the “mess-hall” arrangement pretty interesting – long row of tables, as if one was eating at a cafeteria. “Sit anywhere you like. Is this your first time here?” the man asked. When I admitted that, he invited me to take a look at the selection of items available at the food counter. 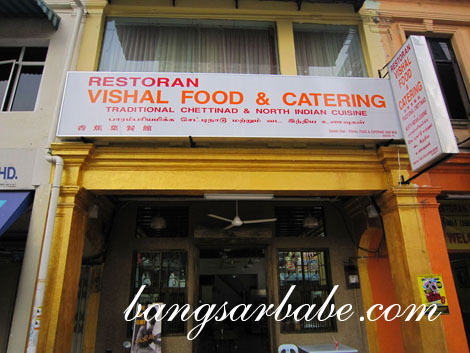 Vishal is a Chettinad restaurant and serves spicy and authentic dishes from Tamil Nadu. He recommended the stir-fried banana flower, something I have never tried before. 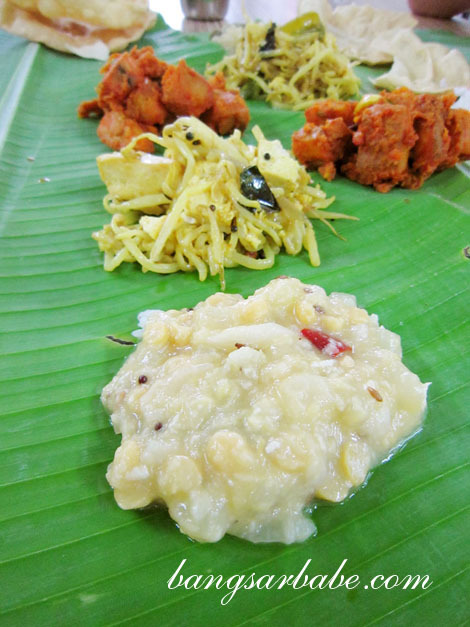 I also got a plate of mutton varuval and chicken perattal to go with my banana leaf rice (RM5). 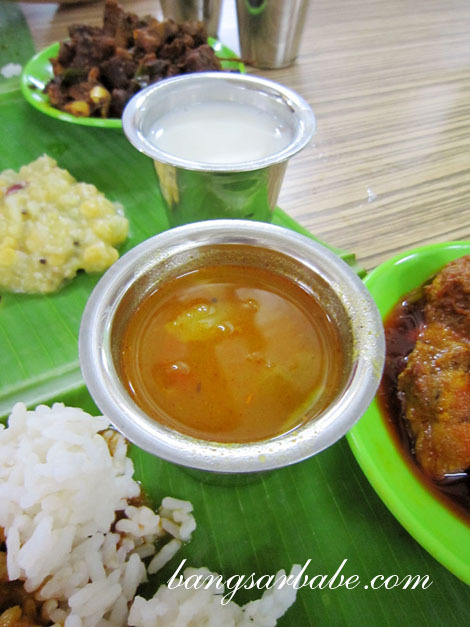 At Vishal, you get an option of white rice or unpolished rice for your banana leaf rice. The latter is ideal for those who are health-conscious or people who need to watch their sugar intake. Rif decided to indulge in the white rice while I stuck to good old unpolished rice. The unpolished rice didn’t get soggy when topped with curry gravies. I have a bad habit of drenching my banana leaf rice (nasi banjir) with chicken curry, but the unpolished rice held its form. The chicken curry gravy was spicy with capital letters. Not that it was a bad thing – I actually liked the spicy level – but those who can’t take spicy food should eat this sparingly. A chilli eater like me turned pink in the face after a few spoonfuls. The accompanying vegetables were pretty standard; I didn’t find any that I particularly enjoyed. But if I had to choose one, I liked the creamed lentils best. 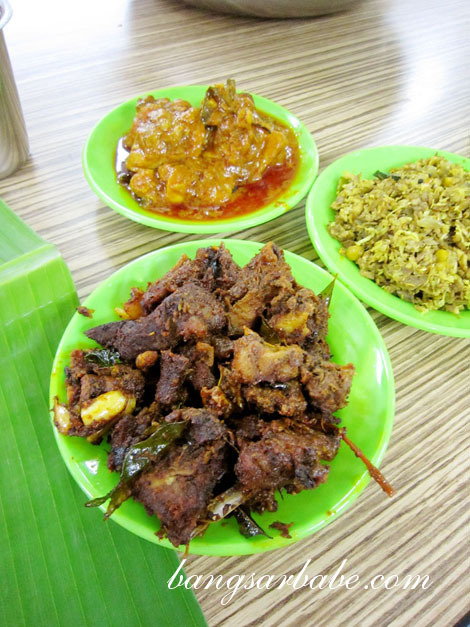 The mutton varuval (RM6) was tasty – dry-fried mutton cubes in chilli and spices. This was rather spicy in a good way and the mutton was tender with a tasty layer of fat. 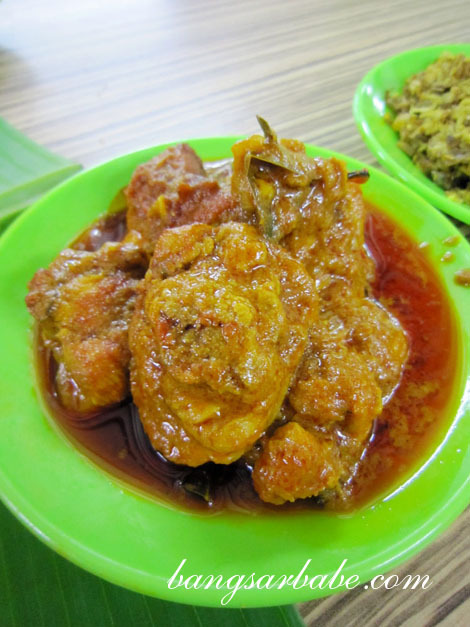 The chicken perattal (RM4.50) tasted quite similar to the mutton varuval in terms of spices. Decent, but I liked the mutton better. This too, was quite spicy. The stir-fried banana flower (RM3) has a touch of creaminess, which I suspect came from some coconut milk or desiccated coconut. This was mildly spiced; a tad oily but Rif and I found it interesting. I enjoyed a type of savoury onion yogurt drink (RM2), as the yogurt was made in house and the onions gave it a touch of sweetness. “Chicken rasam”, the man said as he placed a metal cup of the spicy soup in front of me. A banana leaf rice meal is never complete without rasam, I feel. And this was the first time I tried chicken rasam and I found it quite delicious. Unlike the diluted, overly sour rasam I’ve been getting at other banana leaf rice places, Vishal’s version was adequately thick and flavourful with a nice balance of sour, pepper and spices. The food at Vishal wasn’t mind-blowing, but it tasted home cooked and was hearty in every way. I also didn’t feel thirsty after my meal, so I’m guessing little or no MSG was used. It could be our luck that evening or because the restaurant wasn’t packed, as service was friendly throughout. I liked how the man took his time to explain things to me. Very unlike the awful service I usually get from this popular yet overrated banana leaf rice restaurant in Bangsar Baru. 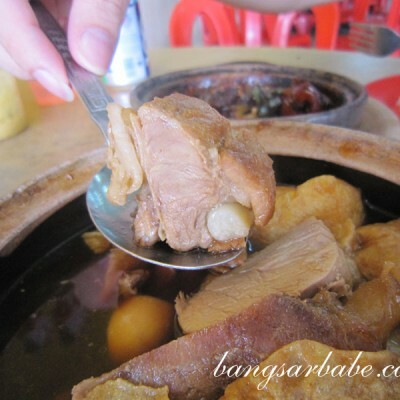 Our meal came up to RM27 – cheaper than what you would pay in Bangsar or PJ. While I can get banana leaf rice just 5 minutes away from where I live, I would rather brave the Brickfields traffic and make my way to Vishal for better food and service. *Read my Star2 column on Vishal here. Verdict: Friendly service, reasonable pricing and pretty decent food. I think our mothers trained us well. Rif doesn’t like unpolished rice, but I love it. Especially with curry! i’ve eaten here…its nice. no frills simple and its definitely little or perhaps no msg involved. 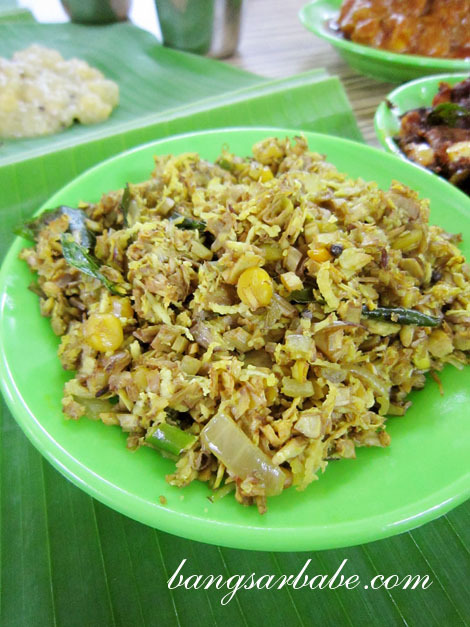 So where’s the best banana leaf rice around? 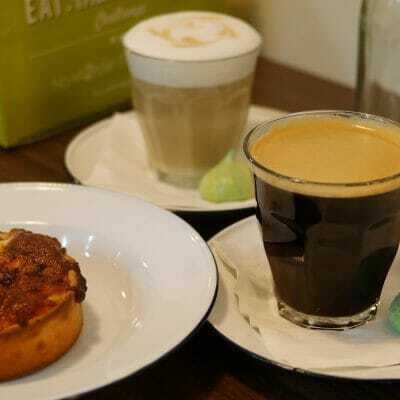 For now, I like Kavitha’s in PJ Old Town. Your pictures makes me hungry.. love your website..
You must be logged in to post a comment. Need to create a new account ? Reviews are based solely on my personal opinion. I am not affiliated to any food establishments and will not be responsible if any disappointments were to occur.